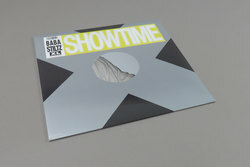 Baba Stiltz - Showtime. Vinyl EP. Bleep. After releases on labels like Studio Barnhus, The Trilogy Tapes and Unknown To The Unknown, Swedish neo-pop wunderkind Baba Stiltz seems set to join the big leagues with his first release on XL. Showtime is, Stiltz claims, something of an odds-and-sods EP, collecting four tunes that he’d had lying around from the past couple of years. Whether they have been pored over for weeks or knocked out in an afternoon, the tracks here are all winning bedroom-pop jams. There is a charm and openness to his music that recalls Jimothy Lacoste, while tunes like ‘Maze’ sit somewhere between Caribou’s Swim and the more recent output of Porches.